This article was originally published on Snowserve in February 2000. Having seen the odd Skwal over the last year or two I had become increasingly keen to try one. For anyone unfamiliar with a Skwal it could be described as the ultimate evolution of the alpine carving board with stance angles of almost 90/90. 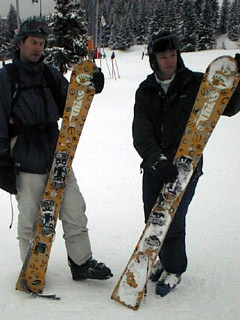 Invented in 1992 by Frenchman, Thias Balmain, and manufactured exclusively by his company, Thias, it looks a like a single ski with a radical sidecut and two bindings. A week in Courchevel seemed the perfect opportunity. So, I persuaded my friend Cass, an expert skier, to try Skwaling with me. We had to hunt around a bit to find a shop that had Skwals for rent but found them in Prends ta Luge in the Forum mall in Courchevel 1850 (quite a good shop with bar and web terminals). Balancing is a major problem as both feet are in-line and the thing itself is not much wider than a ski, some French instructors stopped us and suggested we use ski poles to start with, but by that stage we felt we could do without, however, they would still have been useful to avoid falling over when stationary. 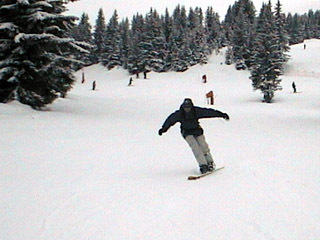 The technique seems to be to bend your knees until they touch each other and point downhill to get going and then simply lean in the direction you want to turn and the Skwal comes round in a beautiful carve as though on rails. I was nervous at first of catching an edge but this seemed not to be a problem, indeed it was quite possible to schuss like a skier for long distances without edging. 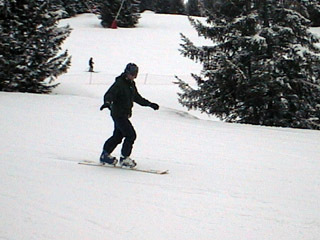 At speed on a wide piste the Skwal was great but I found it difficult to control at slower speeds and awkward to negotiate bumps on and stopping nearly always resulted in desperate windmilling to stay standing followed by a slow motion topple. One novelty we both enjoyed was the attention factor. Everywhere I went groups of snowboarders stopped to look at this strange device, numerous people offered a push when stuck on flats and, interestingly, everyone assumed we must be French! I will definitely be taking Skwaling further, there is a beautiful effortless feeling as you swoop down the slope in gracious carves which I am quite hooked on, but I don't think I will give up the versatility of my snowboard just yet.